fletch is the eighth mobile in my new all-metal series. Did you know those feathers on old-school arrows are called “fletching”? Fletching is meant to help stabilize an arrow in flight as well as increase accuracy. Without fletching, sometimes even the straightest arrows will not hit their mark, tumbling during flight. 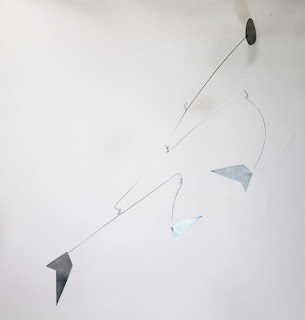 As I made this mobile, the idea emerged that some of life’s biggest targets – goals, intentions, desires – might need more fletching; that one set of feathers is not enough. Perhaps, for those really important life foci, multiple sets of fletching are required for extra stability, better accuracy, and more staying power in flight. This may be especially true when your trajectory steps outside the norm, when you’re looking for more from yourself and your own flight, when outside forces challenge your progress, and when you know your intention, your way, is worthy. The mobile’s three bottom blades represent that extra fletching while the top blade symbolizes the worthwhile target. *25% of the profits from the series will go to Write AroundPortland, one of my favorite organizations here in Portland.